Biomedical engineering major Katina Volitich has designed equipment for use in brain surgery while interning at Rose-Hulman Ventures. First days at work can be hard to plan for. Imagine, as comedian Bob Newhart once did, the Empire State building night watchman starting his new job the evening King Kong climbed to the top of the skyscraper. Katina Volitich can relate. The then-freshman biomedical engineering intern hadn't even organized her workspace at Rose-Hulman Ventures when she was assigned to design a small piece of equipment used in brain operations. "I thought they were testing me," she recalls. She came up with two or three designs that first day and, remarkably, one of them was later approved. 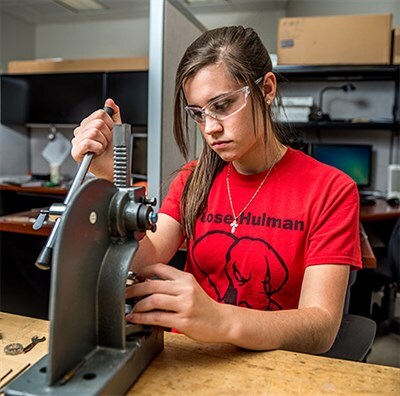 Volitich, now a junior, has returned each quarter to Rose-Hulman Ventures, where she works primarily on projects for NICO, an Indianapolis-based maker of medical equipment. She keeps a tiny tripod, a model of her first-day design, near her desk. "The experience I've gained here is incredible," Volitich says sitting in NICO's creative nerve center at Ventures. "This is the fun part of engineering." During her sophomore year, Volitich designed a Styrofoam box for NICO, also used in the company's game-changing approach to brain surgery. Bits of tumor tissue are carefully removed from a patient's brain and sucked through a vacuum tube into the box. The box is designed to stay cold inside, allowing the tissue to be preserved for future analysis, Volitich explains. An earlier version of the box was far more complicated to assemble, involving several pieces and messy glue. Volitich's box, on the other hand, requires only a single manufacturing cut, dramatically reducing production costs. "You learn to take something from idea to prototype, to manufacturing" at Ventures, she says. Over the past summer, Volitich did an internship with Indianapolis-based Medivative Technologies, a contract manufacturer and, coincidentally, the same company NICO hired to mass produce the box she designed. As a result, she got to observe her box going through the production process. With experience in design and manufacturing, Volitich, whose home is in Pittsburgh, is now looking to intern next summer in technical sales for a Texas-based scientific solutions company. Although a different avenue from her previous experience, technical sales is still something she wants to try. "I'm really just looking to be a well-rounded engineer," she says. With such a wide range of experience, Volitich laughs when asked where she'll eventually focus her talents. With an engineering education, "you get to be a really good problem solver," she says. "I just want to see where I fit best."